What guitar scales are used to play melodies? Home Blog What guitar scales are used to play melodies? What guitar scales are used to play melodies? How do I know what scales to play over a chord progression, and how can I make patterns sound musical and melodic? Melodies, riffs, guitar solos, and bass lines are all derived from the parent major scale that a song is based in. The pentatonic is just a simplified version of the major scale with its own sound characteristics and unique patterns. To understand how to select the proper scales to play over a chord progression, see Fretboard Theory Chapter 7. As for making scales sound melodic, you must first learn licks and phrases from other songs in order to build your repertoire. Everything you learn and memorize can be reworked and replayed over another song. 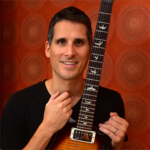 Click here to start learning easy pentatonic song riffs and melodies. Major scale are covered in Fretboard Theory Chapter 5.